belardo Martinez works to clear a blocked duct which leads water to his fields near Colonia Coahuila, Mexico, through a maze of canals from the Colorado River. The U.S. and Mexico have agreed to expand a far-reaching conservation agreement that governs how they manage the overused Colorado River, which supplies water to millions of people and farms in both nations. The agreement to be signed Wednesday calls for the U.S. to invest $31.5 million in conservation improvements in Mexico’s water infrastructure to reduce losses to leaks and other problems, according to officials of U.S. water districts who have seen summaries of the agreement. The water that the improvements save would be shared by users in both nations and by environmental restoration projects. The deal also calls on Mexico to develop specific plans for reducing consumption if the river runs too low to supply everyone’s needs, said Bill Hasencamp of the Metropolitan Water District of Southern California, which supplies water to about 19 million people in and around Los Angeles. The International Boundary and Water Commission, which has members from both countries and oversees U.S.-Mexico treaties on borders and rivers, declined to release a copy of the agreement before Wednesday’s signing ceremony in Santa Fe, New Mexico. “It’s good news for both nations, for water users in the U.S. and Mexico,” said Chuck Collum of the Central Arizona Project, another Colorado River user that will help fund the infrastructure improvements in Mexico. “It’s an acknowledgement that the U.S. and Mexico both share risk due to a hotter and drier future,” Collum said. A study published in February by researchers from the University of Arizona and Colorado State University said climate change could cut the river’s flow by one-third by the end of the century. The river begins in the mountains of Colorado and winds 1,400 miles to Mexico, although heavy use means it usually dries up before it reaches its delta on the Gulf of California where Mexico’s Sonora and Baja California states meet. Along the way, it supplies water to about 40 million people and 6,300 square miles of farmland in the United States alone. Equivalent figures for Mexico weren’t immediately available. The deal being signed Wednesday, known as Minute 323, is an amendment to a 1944 U.S.-Mexico treaty that lays out how the two nations share the river. The treaty promises Mexico 1.5 million acre-feet of water annually. The U.S. uses the rest. The average annual flow in the river is about 16.4 million acre-feet, according the U.S. Bureau of Reclamation, which manages the river in the United States. One acre-foot is enough to supply a typical U.S. family for a year. The new agreement, which will be in force for nine years, does not include a repeat of the historic 2014 “pulse” that sent about 105,000 acre-feet of water surging into the river’s delta in Mexico, the U.S. water officials said. 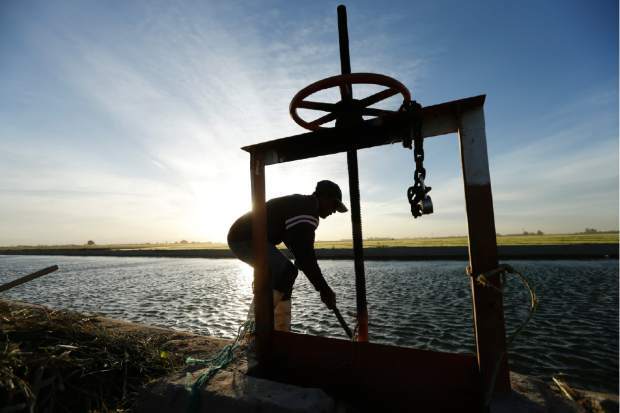 But the agreement does include up to 210,000 acre-feet for environmental restoration projects, according to a briefing from Southern California’s Imperial Irrigation District, one of the funders of the Mexican infrastructure projects.